Slice cucumbers in half and remove seeds with a spoon. Slice into 1/8 inch slices. Toss cucumbers slices with vinegar, salt, and sugar and let rest for an hour. Drain and pat dry. 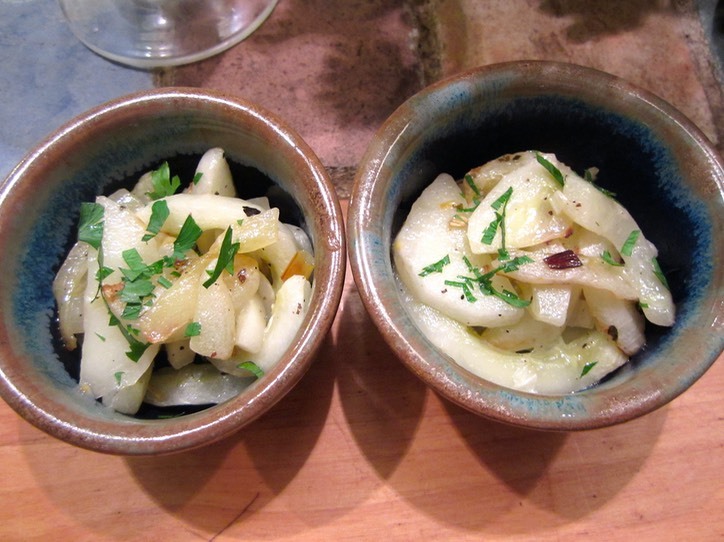 Place cucumbers, green onion, butter and basil in a small baking dish. Bake for about an hour stirring 2 or 3 times. Serve warm with chopped parsley. NOTE: There were several variations, one with reduced cream that sounded delicious, and another with a mornay sauce.